If this takes the place of all those stupid fakes glasses that NBA players wear I will be the happiest man on Earth. Not only are animal hats better than the fake glasses or the insane looking shirts, but they make more sense. Denver is cold this time of year, and nothing protects your noggin like a good old fashioned animal cap. 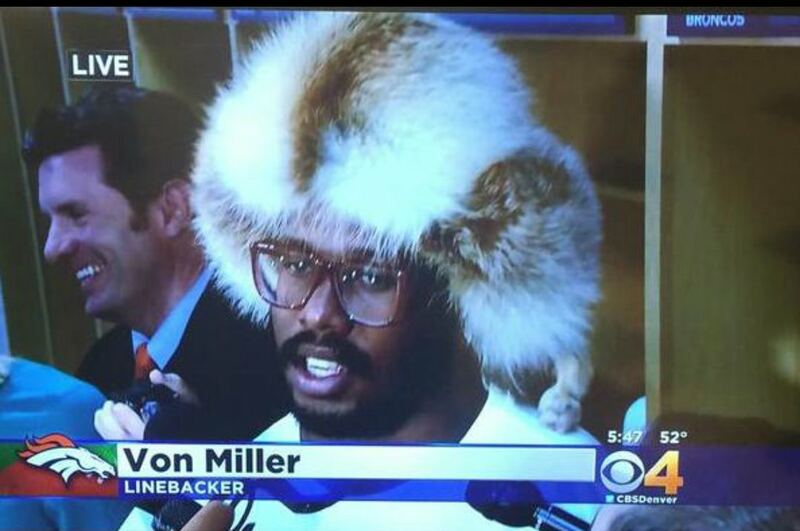 This could be a revolutionary move by Von Miller. Instead of wearing NFL endorsed gear, why not branch out on your own and start wearing different kind of animals instead. Not only is it fashionable, but you get to stick it to Roger Goodell. Win, win, win. Also, that guy laughing in the background is the exact reaction everyone had when they first saw this. Posted on December 8, 2014, in Average Blog Posts and tagged denver broncos, NFL, von miller hat. Bookmark the permalink. Leave a comment.